Why is the massage profession so far behind in getting massage recognized as health care? US Massage Therapists Lag Behind WA State. 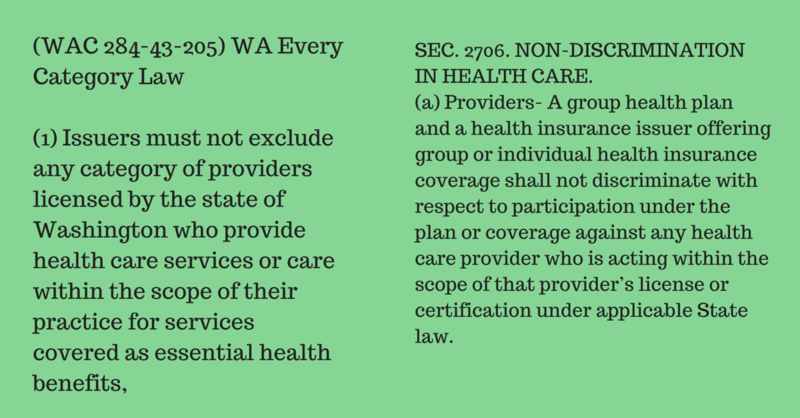 Massage therapists in WA State have been able to bill health insurance since around 1999. How is it that the other states lag behind in being integrated into healthcare? 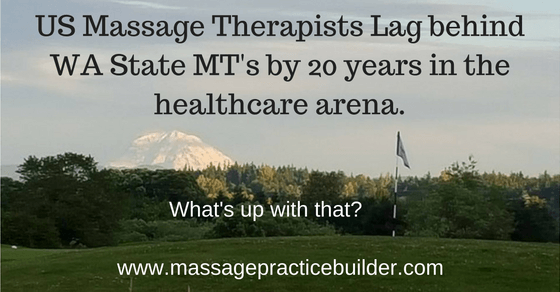 How is it that WA State massage therapists are so far ahead of all of the other states as far as being involved in Health Care? Is it more education? No. We have had 500 hours of required training since about 1989. The one thing that has made the difference in WA State, is that there are people who are willing to stand up for the massage profession and help make changes. How is it that we are even Health Care providers in WA? It was actually by accident almost. In around 1985 ish, some legislator inadvertently added massage therapy to the list of Health care providers. Two massage therapists, Taya Countryman and Susan Rosen contacted the legislature and asked about it. The legislator was going to take it off, but the two massage therapists took a chance and talked to them and showed them just how massage belonged under health care. (This was told to me by Taya just recently – I didn’t know all that!) There it is: People standing up for the massage profession. Every category of health care providers. (1) To effectuate the requirement of RCW 48.43.045 that health plans provide coverage for treatments and services by every category of provider, health carriers shall not exclude any category of providers licensed by the state of Washington who provide health care services or care within the scope of their practice for conditions covered by basic health plan (BHP) services as defined by RCW 48.43.005(4). If the BHP covers the condition, the carrier may not exclude a category of provider who is licensed to provide services for that condition, and is acting within the scope of practice, unless such services would not meet the carrier’s standards pursuant to RCW 48.43.045 (1)(b). For example, if the BHP provides coverage for outpatient treatment of lower back pain, any category of provider that provides cost-effective and clinically efficacious outpatient treatment for lower back pain within its scope practice and otherwise abides by standards pursuant to RCW 48.43.045 (1)(b) may not be excluded from the network. (2) RCW 48.43.045 (1)(b) permits health carriers to require providers to abide by certain standards. These standards may not be used in a manner designed to exclude categories of providers unreasonably. For example, health carriers may not decide that a particular category of provider can never render any cost-effective or clinically efficacious services and thereby exclude that category of provider completely from health plans on that basis. However, health carriers may determine that particular services for particular conditions by particular categories of providers are not cost-effective or clinically efficacious, and may exclude such services from coverage or reimbursement under a health plan. Any such determinations must be supported by relevant information or evidence of the type usually considered and relied upon in making determinations of cost-effectiveness or clinical efficacy. (3) Health plans are not prohibited by this section from placing reasonable limits on individual services rendered by specific categories of providers. However, health plans may not contain unreasonable limits, and may not include limits on the type of provider permitted to render the covered service unless such limits comply with RCW 48.43.045 (1)(b). (4) This section does not prohibit health plans from using restricted networks. Health carriers offering plans with restricted networks may select the individual providers in any category of provider with whom they will contract or whom they will reimburse. A health carrier is not required by RCW 48.43.045 or this section to accede to a request by any individual provider for inclusion in any network for any health plan. Health plans that use “gatekeepers” for access to specialist providers may use them for access to specified categories of providers. (5) Health carriers may not offer coverage for health services for certain categories of providers solely as a separately priced optional benefit. (6) The insurance commissioner may grant reasonable temporary extensions of time for implementation of RCW 48.43.045 or this section, or any part thereof, for good cause shown. (7) All health carriers and their plans, provider contracts, networks and operations shall conform to the provisions of this section WAC 284-43-205, by January 1, 2000. I have seen Deborah Senn speak at a few conventions and have heard her explain how it all came to be. Basically, she had a massage therapist who helped her get better and this massage therapist – Lori Grassi (formerly Belinski) was very politically active and a member of AMTA-WA. (I also heard that Lori might have worked with Deborah Senn in her law office.) Together they created the law. The statute was supposed to go into effect on Jan 1, 1996. The insurance companies fought the law for many years until finally in about 2000, there was a US Supreme Court decision that upheld the law in 1999 and made it so. It took another few years to implement and get the insurance companies organized. Senn was taking a stand and making a difference for the massage profession in WA State. 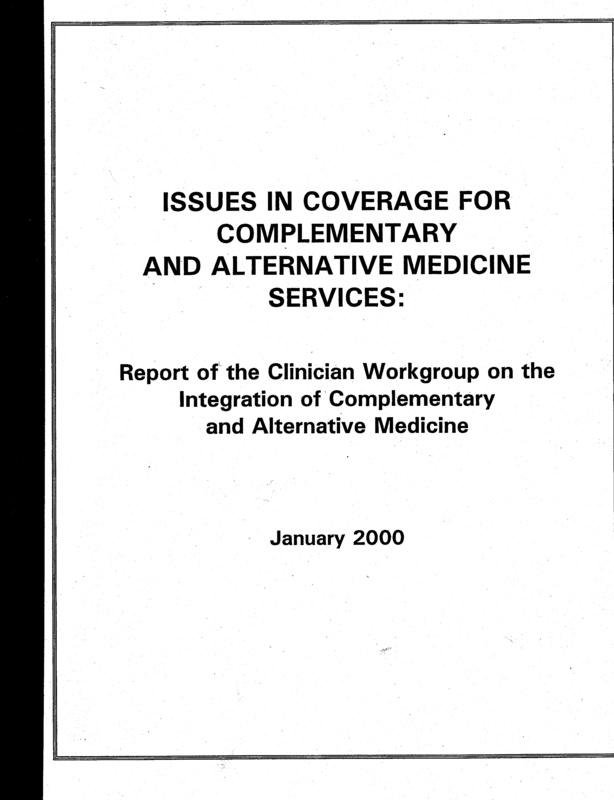 There was a Clinician Workgroup that was created and who wrote this report that includes the timeline of events which ends with a Supreme Court Ruling – Issues in Complementary and Alternative Medicine Services. The workgroup was also instrumental in pulling information together for the insurance companies to help them figure out how to integrate us into their system. Massage Therapists must first apply to be contracted providers. The process involves filling out the credentialing application and being approved by each insurance company or their representative organizations. That process is all done online through www.providersource.com. You can bill electronically though www.officeally.com and also be paid by direct deposit by many of the companies. It is getting easier and easier to bill and get paid with the help of technology. It is also required that you have an NPI number and be HIPAA compliant. Billing is done electronically along with payments from the insurance company. Aetna, Cigna, Group Health and Corvel are managed by Whole Health Networks. The one other good thing is that there are plenty of massage therapists doing just that and there is power in numbers. You can learn and get support for the extra challenges and issues. It can help keep your massage business stable in any economy as people will always come in under their insurance when they need it. Hospitals are looking to massage to help them have better outcomes using massage in headache and pain clinics as well as birthing centers, cancer wards and hospice care. Wouldn’t it be amazing if massage could be covered on insurance in those cases? So what is a Massage Therapist and the massage profession to do? Do you want more regular weekly clients for a short time, that have injuries and health conditions that you have to deal with? Do you want to keep up to date with all the laws, regulations and procedures? Do you want to fight the battle for better allowable fees (what you are paid) and for better benefits? What if massage could be the first line of treatment for the many pain conditions that are often treated with addicting drugs? What if you could get regular weekly massage to help during stressful times? Learn to bill insurance so you know what is going on and can see first hand what needs to be done. Just commit to taking on one or two cases to learn the ropes. I am not talking about having a full practice of all insurance billing. I have an easy to read book on the procedures for billing and offer support in a closed Facebook group for any questions you may have on billing insurance. Contact Your Local AMTA Chapter. They are more politically active. If your chapter is clueless, then consider starting something and working with the Government relations person to get something going. Gather some friends together to help you. Find out if you are considered to be a healthcare provider in your state. WA, FL, NY, NC, GA, MI, OH, VA, MD (LMT’s only), WA DC, TN seem to be under this classification. You have to check in your state health care laws which is a different section usually than just your massage licensing laws. To get your state to consider you to be a HCP, you will need to do some legislative work. I know in WA, it was actually almost a fluke that we got that status. About 20 years ago, one of the law makers mistakenly put massage in the HCP category and when 2 of WA states MT’s saw it they confirmed it and also stood up and proved that we should stay in that category. Contact the office of the insurance commissioner and start asking what will need to be done to implement 2706 of the Affordable care act. 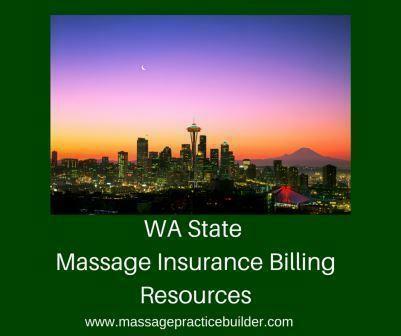 You will most likely need this document (PDF) that was created by AMTA-WA for the WA State Office of the Insurance Commissioner to show that massage is part of the Essential Health Benefits. Contact Integrative Healthcare Policy Consortium ( IHPC ). They are the only organization I could find that was doing anything actively to get 2706 implemented. Last year they hired Deborah Senn (WA States past insurance commissioner who created the every category law in WA.) to go to some of the states to see what needed to be done to get the law implemented. The chiropractors actually were part of hiring her. She is a great resource. IHPC could also use money so that they can hire more people to start standing up for us. AMTA National and other massage associations have let us down. They should have been working on this across the nation starting in 1996 when Debra Senn created the law here in WA. We need more massage therapists to start billing so you can see how things works and see what needs to be done. We need more legislation, more education, more research and more massage therapists getting involved politically to make this all happen. We need the to get more politicians on our side. We need YOU to help us change things. category of provider” mandate as part of the 1993 Health Care Reform Act. category of provider mandate in RCW 48.43.045. The statute was to be effective January 1, 1996. 18, 1995 to the CEO’s of all disability insurers, HCSC’s and HMO’s requesting the submission by September 15, 1995, of a time line and work plan for achieving an adequate network of every category of provider. September 1995 Carriers submitted plans as requested by the Insurance Commissioner. December 19, 1995 The Insurance Commissioner issued Bulletin 95-9 setting forth the Commissioner’s interpretation of RCW 48.43.045. None of the carriers’ previously submitted plans would satisfy that interpretation. January 8, 1996 Carriers filed a lawsuit in Thurston County Superior Court, sub nom Blue Cross of Washington and Alaska v. Semi, to have a court decide the correct interpretation of RCW 48.43.045. April 8, 1996 Superior Court dismissed lawsuit due to carriers lack of exhaustion of their administrative remedies. May 21, 1996 Carriers filed a Petition for a Declaratory Order to have the Insurance Commissioner decide the correct interpretation of RCW 48.43.045. August 21, 1996 The Insurance Commissioner issues the Declaratory Order requested by the carriers. August 1996 Carriers sue the Insurance Commissioner in Thurston County Superior Court, asking the court to reverse the Declaratory Order and stay all enforcement of it. September 1996 Carriers sue the Insurance Commissioner in Federal (Employee Retirement Income Security Act) preempts state implementation of RCW 48.43.045 as to employer plans. September, 1996 Superior Court orders enforcement of Declaratory Order stayed until the court can decide whether the Commissioner interpreted RCW 48.43.045 correctly. December 11, 1996 Insurance Commissioner convenes carriers and provider groups for discussion regarding RCW 48.43.045. January 3, 1997 Insurance Commissioner facilitates provider discussions regarding provisions of RCW 48.43.045. January 6, 1997 Insurance Commissioner facilitates discussions between the carriers and providers regarding RCW 48.43.045. Providers present proposals for implementation. January 23, 1997 Insurance Commissioner facilitates discussions between carriers and providers regarding RCW 48.43.045. Providers deliver further proposals for implementation. February 6, 1997 Commissioner reviews measures presented by the carriers for implementation of RCW 48.43.045. Office of the Insurance Commissioner prepares plan matrix of currently covered benefits for alternative providers. April-May 1997 Commissioner prepares for a facilitated meeting with providers and carriers to discuss clinical aspects of alternative therapies in health plans. May 2, 1997 Federal District Court rules that ERISA preempts state implementation of RCW 48.43.045. May 9, 1997 Insurance Commissioner files a motion in Federal District Court to clarify whet.er the court’s May 2nd ruling applies to non-ERISA governed health plans. May 30, 1997 Insurance Commissioner files an appeal with the 9th Circuit Court of Appeals of the May 2, 1997 ruling that preempts RCW 48.43.045 from ERISA plans. May 30, 1997 Insurance Commissioner supports a facilitated meeting of health plan medical director’s and representatives of alternative provider professions discussing clinical aspects of alternative therapies in health plans. July 23, 1997 Federal district court denies the Commissioner’s motion to clarify the ruling. July 30, 1997 Insurance Commissioner refiles the appeal to the 9th Circuit Court of Appeals. September 29, 1997 Washington state brief filed with the Ninth Circuit Court of Appeals. Amicus briefs filed in support of the position of the Office of the Insurance Commissioner by U.S. Department of Labor, National Association of Insurance Commissioners and provider groups. May 7, 1998 Oral Argument in 9th Circuit Court of Appeals. June 18, 1998 9th Circuit Court of Appeals reverses the lower court and directs summary judgement be entered in favor of the state. July 3, 1998 Plaintiffs petition the 9th Circuit for a re-hearing on it’s June 18, decision. August 24, 1998 Ninth Circuit denies the plaintiffs petition for are-hearing, and rejects the plaintiffs state law arguments under 48.47.005-030, in addition to the ERISA claims rejected in it’s June 18 decision. September 17, 1998 Plaintiffs notify Thurston County Superior Court they will file a “petition for Writ of Certiorari with the United States Supreme Court” from the decision of the Ninth Circuit. November, 1998 Plaintiffs filed Writ of Certiorari with the US Supreme Court to review the lower court’s decision. December 20, 1998 OIC filed a brief in response to the Plaintiffs petition in the US Supreme Court. Certiorari, leaving the decision of the Ninth Circuit Court of Appeals to stand. Every Category Law makes it mandatory that massage therapists be included as providers for health insurance plans. Most of the lists are closed to new providers. You should still fill out an application and request to be on the waiting list. You might also want to call them weekly to get on the list. Another idea is to call the local massage therapists who are in your zip code who are already on the list of providers for that insurance company and ask if they are accepting new clients or find out if they are still in business. Often times therapists will leave the network but the insurance companies don’t seem to add new therapists. The insurance companies must provide enough therapists in each geographic area. Healthways/Whole Health Networks covers Cigna, Aetna, Group Health and Corvel which is a combination of auto insurance companies. Preauthorization for Regence Blue shield required through Carecore.com. Regence Uniform is exempt from preauthorization as well as some other companies that are self-insured. Massage therapy treatment request clinical worksheet (PDF) – You will use this when you request more sessions after the initial approved sessions are completed or the time allotment has passed. You can use www.officeally.com for free to bill these companies directly electronically. In order to receive ERAs (Electronic Remittance Advise) through Office Ally you would want to complete the ERA pre enrollment forms for each payer. To find the ERA enrollment forms you will want to go to Resource Center > Payer Enrollment Forms. On the Payer Enrollment forms you will see the link for Electronic Remittance/ ERA/ 835 Enrollment forms which will take a you to a list of alphabetized payers and their instructions for ERAs. Receive Payments through direct deposit. Contact each company to set this up. You can also bill massage services for car accidents. Start with making sure that the client has personal injury protection benefits in their insurance plans. That will cover the costs up front up to whatever limit they have on their policy making it so that you can get paid right away and not have to wait until the case settles. Personal Injury Protection is required by law. The customer can also decline having PIP coverage when they can prove they have health insurance coverage and say they don’t want PIP. Make sure the customer has this in writing, or PIP must be part of the insurance. Client will start PIP claim through their insurance. Confirm benefits and the amount left in the PIP account by calling the claim manager. When PIP benefits are used up, the claim moves to a third-party claim. The insurance of the person at fault will get money at the time of settlement to pay remaining bills. Be sure to have the client sign an official contract saying that they will pay the bill. Massage Businesses must be owned by a Health care provider – Statute Laws (looking for resource on this). Yes that makes Franchises/spas/Clinics that are not owned by a MT, DC, MD illegal. RCW 25.15.045 Professional limited liability companies. Massage Therapists must create a PLLC (not a LLC). RCW 18.100.050 Organization of professional service corporations authorized generally — Architects, engineers, and health care professionals — Nonprofit corporations. Summary of Evidence (PDF from AMTA-WA website) – How Massage Fits into the Essential Benefits of the ACA. Heal-wa.org – Great free resource for licensed massage therapists in WA State. Find research papers, CPT code books and more. I had the pleasure of attending a symposium called The Future of Bodywork: Surviving Corporate Healthcare last night put on by Jack Blackburn and the Trillium Institute in conjunction with Brian Utting and the Pacific Northwest School of Massage and wanted to share my impressions and insights as we move forward in WA State as health care providers. Deborah Senn, our past insurance commissioner who created the ‘Every Category Law of Providers” (WAC 284-43-205) was the first to speak. In 1993, Senn created the Every Category Law as a part of the 1993 Health Care Reform Act. Two years later, that act was repealed but luckily the Every Category Law remained in tact. Nine insurance companies sued the insurance commissioner and over the course of 3 years, the battle ended in the 9th Court Circuit of Appeals decision to keep the law intact followed by the US Supreme Court decision in Jan 1999 to deny the Writ of Cerioriari leaving the Ninth Circuit Court of Appeals to stand. There is legal precedent to have this happen in every state if someone/some organization/some group would just stand up and help to implement it all. SEC. 2706. NON-DISCRIMINATION IN HEALTH CARE. nsurance coverage shall not discriminate with respect to participation under the plan or coverage against any health care provider who is acting within the scope of that provider’s license or certification under applicable State law. This section shall not require that a group health plan or health insurance issuer contract with any health care provider willing to abide by the terms and conditions for participation established by the plan or issuer. Nothing in this section shall be construed as preventing a group health plan, a health insurance issuer, or the Secretary from establishing varying reimbursement rates based on quality or performance measures. ering group or individual health insurance coverage. 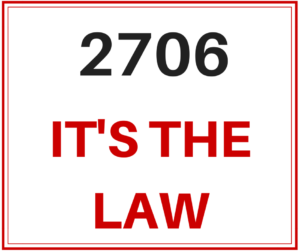 2706 applies to all plans and all carriers. That means that it should apply to ERISA Plans too (See US Dept. of Labor Explanation) – you know those plans like that of Microsoft and other large companies that create their own insurance plans for their employees and hire other companies to mange them. So why aren’t those plans currently paying? The question was never proposed or answered. Senn is also a professor at Yale (or was it Harvard…I can’t remember) teaching insurance and she has her students doing the research of finding out which states are implementing 2706 and which are not. It depends on what states have chosen to implement their own system or to use the Federal Healthcare system. Her findings so far is that no states are implementing 2706 — so whats a massage therapist/CAM provider to do? They have just created www.covermycare.org to help get the process rolling. New Massage CPT Codes for all! Susan Rosen who is a massage therapist in WA State and is an active member of AMTA-WA and AMTA National who was also instrumental in helping to integrate massage into health care under the Every Category Law. She is currently working on the new CPT codes for Therapeutic Interventions for body Structure and Function through the American Medical Association Current Procedural Terminology (CPT) Health Care Professionals Advisory Committee (HCPAC). The codes are being set by a workgroup of practitioners from PT, OT, and Athletic Trainers. The codes will be based on the level of complexity of the clients condition and the clinical decision making process, comorbidities and complexity of how you approach a clients care. Comorbidity is the presences of other diseases and conditions, like having diabetes and having a hamstring pull. Physician codes already do that. The date for the release of the codes is Jan 2016 but Rosen was skeptical that the date could be met. When the new codes do come out there will be much to do in working with the insurance companies to set the allowable fees. Also article on CPT codes in AMTA-WA Journal (PDF) by Susan Rosen (Page 22). Rosen recommends we continue to improve our communications and networking with other healthcare professionals to help bring us into this new age of healthcare. Michael Hamm was the MC and also one of the speakers. His background in research and teaching made me think more about what we need to do to start communicating better with clients and other healthcare professionals. It is also about how can we preserve our authenticity in the face of the grueling insurance companies. We need to start talking about meaningful activities. When does a client actually know the are ‘better’? Marissa Brooks who is a past member of the State Board of Massage and currently Director of Health Improvement Programs for the Health Benefits Trust talked more about what she sees happening in healthcare. Glynn Desmond is one of the AMTA National Member at large and also the owner of the Monroe Therapeutic Massage Clinics around the Seattle area, helped clarify why we don’t have much say in what insurance companies pay us. Hospitals have much more negotiating power because of the size of the organizations. If massage therapists try to rebel and fight the system, the main option is to leave the network but the insurance companies don’t really care as they will get more massage therapists to fill their spots. The main questions were around what can we do to get the insurance companies to pay us more and also to get their lists open so that more can become providers. There is no answer really other than it takes money…we need to hire more attorneys and lobbyists and people to stand up for us. We do have the AMTA WA who has been doing this consistently through the many years but it just takes more money. The AMTA WA did get their lawyer to look into the issues with Care Core in limiting the number of treatments they approve through the pre-authorization process which limits sessions to 4- 6 sessions no matter what the condition – if they fell down the slopes skiing or just tweaked their shoulder brushing their teeth- the number of sessions is the same. Personally, I find the pre-authorization process frustrating but I can also see that it is limiting maintenance massage which is not paid for by health insurance companies. I do not know how they have come up with the number of sessions that it takes to heal various conditions which is something that needs to be explained. Senn mentioned that the acupuncturists were also looking into this and I do know that the chiropractors were fighting this without success. Senn recommended that we contact the Office of the Insurance commissioner with our concerns and most importantly have your clients who are frustrated with the pre-authorization process contact them too. A fax blitz is recommend if we could ever get our act together! (oh but it looks like they have taken their fax number off of the website – I wonder if it was after someone fax-blitzed Senn!) WA State Insurance Commissioner contact page. File a complaint page. As far as getting them to pay us more…well we can’t approach insurance companies through AMTA-WA or any organized group as it will violate anti-trust laws around fee setting. There is always talk that a Union is needed for that but when most MT are self employed, I am not sure how that would work. If you are looking to get on the provider lists, call or contact the companies weekly. If you are looking to get on the provider lists, start with the current provider list of massage therapists and contact each one of them and ask if they are still accepting new clients. Keep track of who is and also keep track if providers have moved or left you area. Contact the insurance companies with this information. Contact your local AMTA chapter to see if they are doing anything to implement 2706 in your State. If they are not doing anything, see if you can start a committee to do so. Contact your States Insurance Commissioners office and ask them what needs to be done to get 2706 implemented and start working with them to implement it. You will need to hire attorneys and lobbyists to get involved, so it is best to start with AMTA to get organized as they have more influence in this area. Start learning how to bill insurance. In most states you can bill for car accidents and workers compensation. You can purchase my ebook on this for starters and join my private Facebook Group to start learning what needs to be done to bill. Start working with Doctors, Physical Therapists, Chiropractors, Naturopaths and join with them in for improving patient care and also for organizing to work with insurance companies. There are already many businesses providing insurance for their employees that DOES cover massage. BCBS of IL does for starters. That is without having laws in place. Start finding out if you can bill certain insurance plans in your state. Join my group Massage Practice Builder on Facebook to start sharing information. Vote and elect an insurance commissioner that will work with you to implement 2706 or that supports massage therapists. I asked Deborah Senn about 5 years ago what needs to be done in other states and she just said that they need someone to stand up for them like she did. Learn the history of health care integration how it came about in WA State and learn from them/with them through AMTA. Contact AMTA National to see what they are doing as far as hiring a National Lobbyist Team and Attorneys and to get more money and assistance to the State Chapters. If you are an AMTA member, you need to vote to make sure the right people are there to lead us into the future. The evening was jam packed with information but I have to say not much was news and there is still much to figure out. We need to keep the discussions going on this throughout the state. You can join me at our local NW LMP Support Group at www.meetup.com or continue this at the AMTA-WA Convention in April 2015. And Join me at the next Symposium on Education. Why do I keep pursing this with so many challenges? There is power in numbers…what if massage could be the first response to pain, injuries, diseases and other conditions? I know I am always talking about massage insurance billing and how it is one of the things that has allowed me to stay in business now since 1989, but there is the other side of billing insurance: The headaches with insurance companies, healthcare changes, working with doctors/lawyers and things like how clients deal with their health issues. I do talk about them in my book Insurance Billing 101 for Massage Therapists, but I want to expand on that info here now. It has always been a mixed blessing for me as you can see from this editorial Massage Insurance Billing (PDF) I wrote on it in 2005 for Massage Magazine. The first challenges are really all of the hoops you need to jump through when working with insurance companies. You are really subject to their rules and regulations along with the benefits of each plan. You have to always be on top of what you need to be doing. They change their plans/rules as often as they wish and you are often left trying to figure it out on your own. Things in healthcare are constantly changing with HIPAA laws, billing forms and knowing what you need to do to get paid. As a provider for health insurance companies here in WA, the insurance companies are constantly lowering their allowable fees (cutting our pay!) and reducing benefits in their plans. They are also doing things like requiring pre-authorization for massage services according to what they have found to be medically necessary but they haven’t really told us how they determine this. In the beginning of billing health insurance which was around 2000 or so, the insurance companies paid between $60 an hour (4 units of massage) to $120 or more for an hour session. It is now between $57 and $67 an hour. That is much less than what I charge my cash clients. I also have had to raise my fees for cash clients in order to still make the same amount without having to work more per hour. Some massage therapists often envision that getting into insurance billing is like getting into bed with the devil. The insurance companies are seen as evil parts of society. Insurance companies are about profit, greed and money and are not about HEALTH, healing or being healthy. I also have been seeing more people who won’t come in for massage unless their insurance is paying. People have become almost dependent on insurance paying. It has become more of a right here in WA. People who use their insurance also have a tendency to take it for granted. They are often the first people to cancel in the last minute or not show because they know that the insurance company is supposed to pay and they don’t know that a massage therapist can not bill the insurance company for a missed appointment. You can set cancellation policies around this too and have the client pay for the missed appointment. People will come in saying I have 16 visits a year and I just want to get massage but often don’t realize that it has to be medically necessary. It has to be prescribed by a physician and the sessions have to show improvement. If massage isn’t working, I send them back to their doctors. Many would just prefer to keep getting massage. It is also a mixed blessing taking insurance when clients begin to count on their insurance to pay because it somehow makes a massage session more around fixing the client. While we are taught to fix and know how to fix things that have gone haywire in the musculo-skeletal system, often there is a deeper part of healing that goes beyond fixing that massage can address. Often the real work is in being present for the client and following the ‘path’ of their illness/disorder (Pathology). But the insurance companies/doctors/lawyers only want to know if the client is ‘fixed’. It ties us deeper into that part of us that Loves to fix and Loves to feel powerful when we can fix. Clients will often be seen wanting us to ‘fix’ them, when in reality they are the only one who can fix themselves. Insurance companies are also closing their provider lists here meaning even if you wanted to bill, you can’t unless you are already a provider. They are saying that there are too many massage therapists for the number of patients that they have. Some of the lists have been closed for years even though many massage therapists have left their networks and/or gone out of business. So why do I persist in all of this insurance billing crapola? Yes it has allowed me to stay in business for over 25 years but I have also gotten to work with many injuries and conditions that I would have never seen really because people who are seriously hurt or sick may not have the funds to get the help they do need. Fibromyalgia – reducing the need for drugs, loss of work etc. Deborah Senn, has told me in person, that the ACA should help us here in WA although I have yet to see how. Deborah Senn was instrumental in getting massage accepted here by the insurance companies back in 1996 with the creation of the Every Category Law that now reads really closely to the 2706 section of the ACA. I also heard John Weeks of the Academic Consortium for Complementary & Alternative Health Care (ACCAH) speak at a conference with the Alliance for Massage Education in 2012 and the one thing that he said I found most interesting: “There is Power in Numbers” meaning that there are over 300,000 MT’s in the US and then you can also count on their clients who love massage. Could it truly work that way? Could massage therapists have an impact on the level of care patients get? Could massage ever be the way to put the HEALTH back into Healthcare?